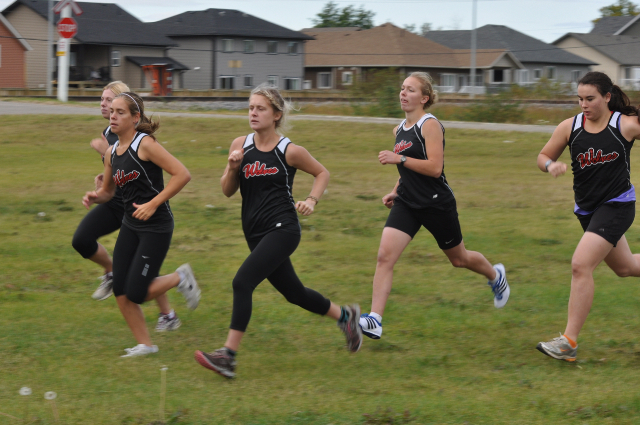 Current and former members of the GPRC Wolves x-country running team were in action on a number of fronts on Saturday. In Vemilion, AB, Devin Woodland had a strong run, finishing 6th overall, and 3rd amongst the college runners, at the ACAC Grand Prix #2 race. Woodland covered the hilly 8 km course in 29:54. Wolves coach Bill Corcoran placed 37th. In the womens 5 km race, a pair of Wolves runners finished in the 30s – Carina Ness was 32nd while Linnea Saltel finished 39th. Former Wolves runner Carly Pura, now running for Augustana, was 37th. Meanwhile in Fort St. John, the Wolves women swept the top 5 places at the Grailquest 5 km, Race #3 in the 2011 Wolves X-Country Running Series. Kayla Hardy led the way winning her second Wolves Series race in as many weeks. Amanda Patteson placed second in her first-ever x-country race. Lena Farrow, Vanessa Besharah, and Davis Alton trailed the leading duo. In the mens race, Wolves rookie Duncan Farrow also recorded a victory. Finally, in Seattle, Washington, former Wolves standout Fiona Benson, now running for Trinity Western University, placed third in a field of 187 runners in College Open race at the Sundogger X-Country race hosted by the University of Washington. Benson recorded a time of 22 minutes even for the flat and fast course. Next up for the Wolves is the Bezanson Bog, race #4 in the Wolves X-C Series, next Saturday. This entry was posted in Cross Country, Uncategorized and tagged ACAC, Cross Country Running, GPRC, Grande Prairie, Trinity Western University, Wolves Cross Country Running. Bookmark the permalink.